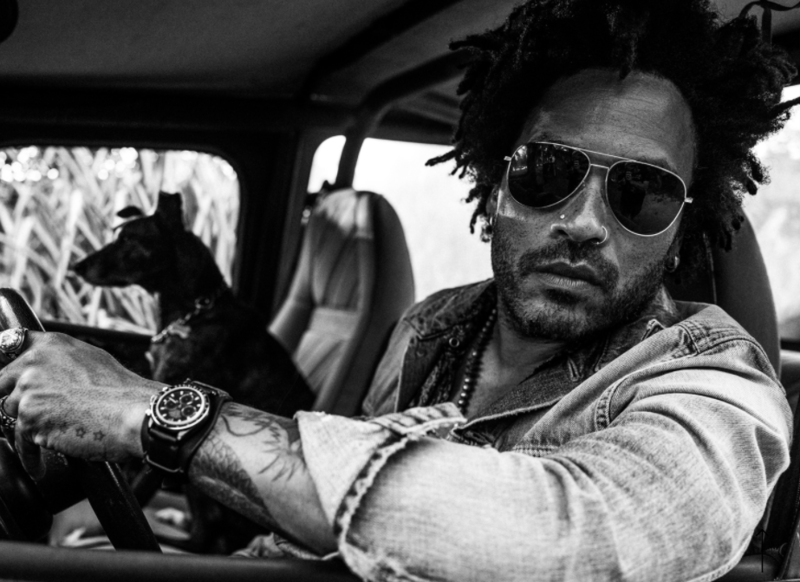 Lenny Kravitz redesigns a line of his Rolex Daytona. Lenny Kravitz is a true renaissance man. Aside from winning multiple Grammys and every other musical award under the sun, he has designed his own line. Kravitz designs a rock star-worthy furniture as well as commercial and residential interiors for a number of clients. Now the rock&roll icon has turned his hand to watch design, with a custom take on the classic Rolex Daytona designed in collaboration with Les Artisans de Genève, a “watchmaking maison” (house) that creates limited edition timepieces with hefty pricetags. Kravitz’s “Rolex LK 01” as it’s called – which might have the suits in Geneva firing off cease-and-desist letters – will be produced in an extremely limited run of 55 pieces at $37,800 each. Kravitz’s “Rolex LK 01” as it’s called – which might have the suits in Geneva firing off cease-and-desist letters – will be produced in an extremely limited run of 55 pieces at $37,800 each. While some fans like “new” Daytona, but others hate this complete redesign. The LK 01 by Lenny Kravitz, has a huge make over. To create the LK 01 Les Artisans de Genève starts with a few requirements, a stainless steel and yellow gold black dial Daytona 116523. The case and movement are completely disassembled and then given a black DLC and PVD treatment in addition to a 22-karat gold rotor. 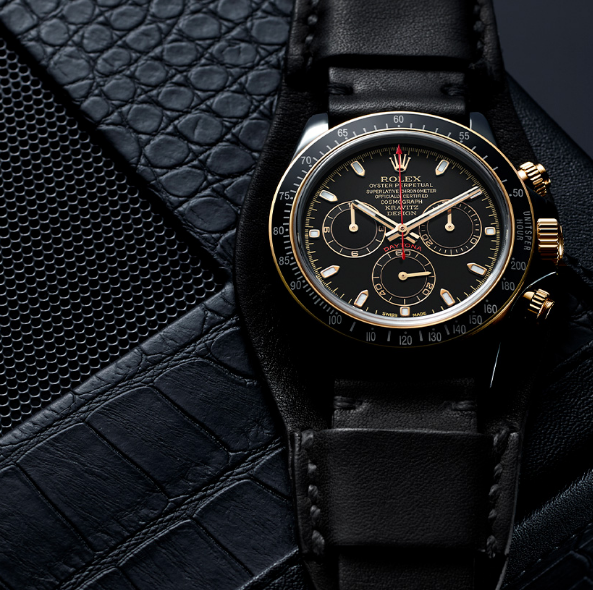 The Daytona also gets a Bakelite treatment on the bezel, a black leather bundt strap. He adds the words”KRAVITZ DESIGN” in a special font on the dial. Most revolutionary of all, a sapphire back so the movement can be viewed, something Rolex itself has never done. Of course customizing the watch voids Rolex’s warranty, but Les Artisans de Genève promises to “fulfill future service obligations”. 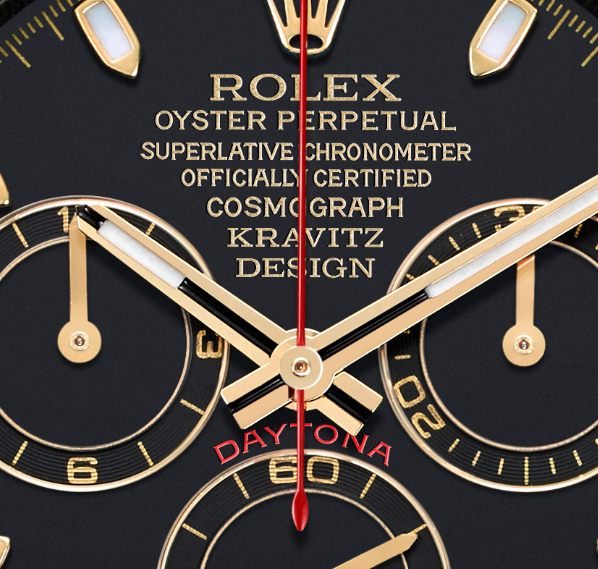 On the face of the Daytona “Kravitz Design” is added. The LK 01 is on leather instead of a traditional stainless steel, or gold bracelet.